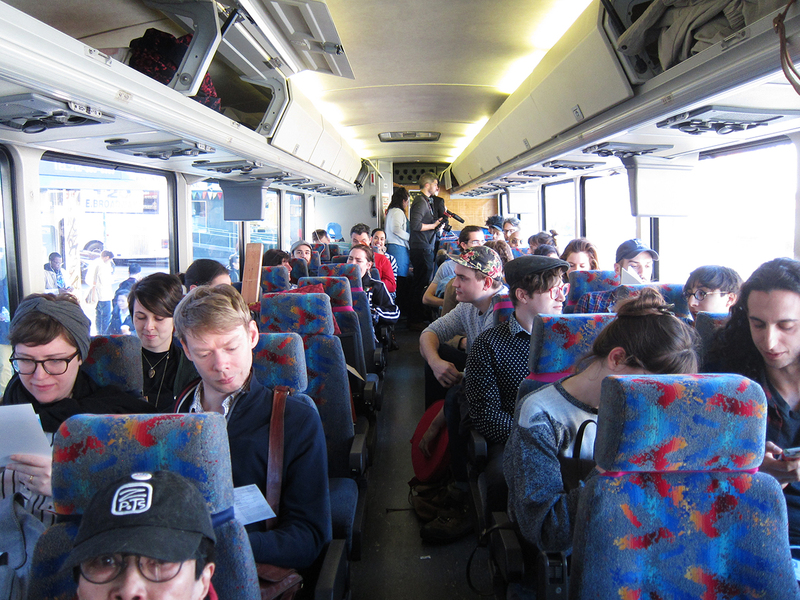 So said artist Seth Timothy Larson to me as we emerged from the Holland Tunnel last Saturday morning, on board a Chinatown bus en route from New York City to Philadelphia, its 55 seats occupied by passengers experiencing what was far from your average intercity bus ride. 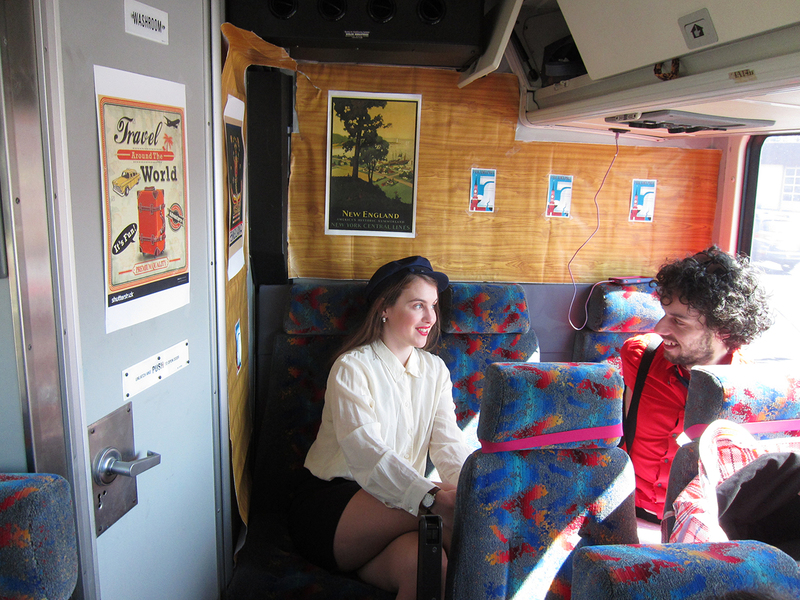 We were on the second leg of the Fung Wah Biennial, an exhibition organized by Flux Factory spread over the course of three weekends, with each iteration occurring on a roundtrip bus ride to and from Boston, Philadelphia, and Baltimore, respectively. Co-curators Will Owen, Sally Szwed, and Matthias Borello selected over 20 artists from around the country to create site-specific works for the bus and for the destination cities; the remaining two dozen or so seats are filled by “viewers,” aka ticket-purchasing, in-the-know passengers quite literally along for the ride. 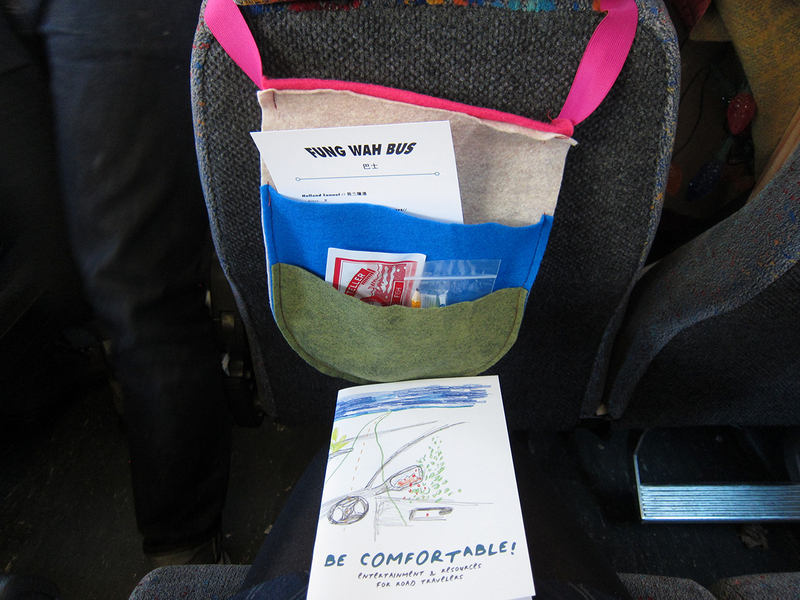 Passengers on the March 12 bus — chartered from another Chinatown coach service — could read about Fung Wah’s history in an illustrated zine created by PINES/PALMS, a collaboration between artists Emily Ensminger and Sophie Trauberman. 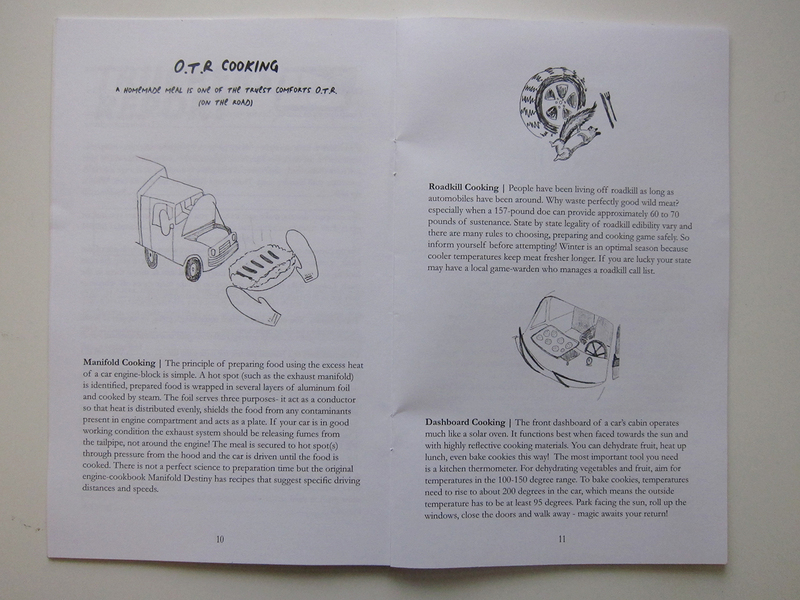 Part of their contribution, titled “Resilience of Comfort,” the zines were distributed in pouches hanging from seat headrests that held travel amenities to provide comfort and entertainment on the road. 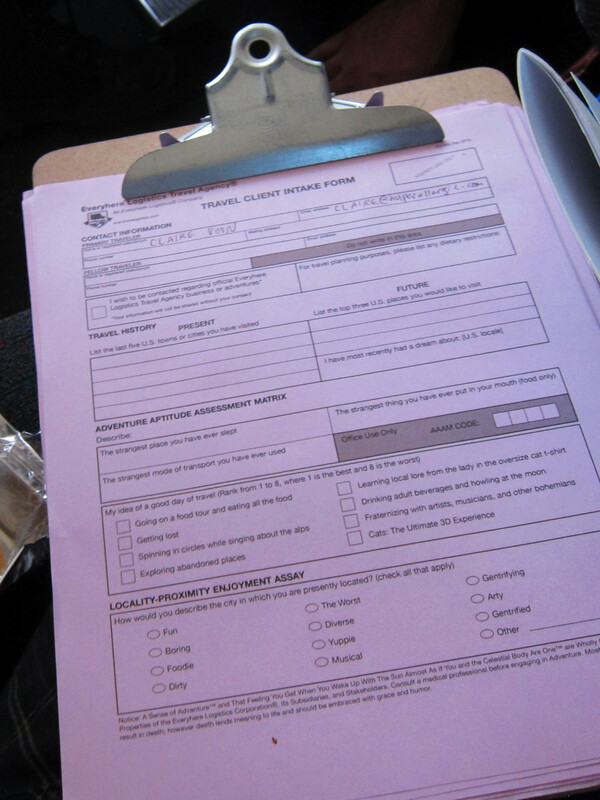 Word searches, bus-related literature, earplugs, and a bag of potpourri alluded to the compromises we make when we travel cheaply and the myriad ways we adapt public space to our individual needs. Personal space is, obviously, a huge part of traveling in a tight bus (admit it, you’ve been quick to place bags on the seat adjacent to yours in attempt to keep it empty). On this bus, personal space was practically nonexistent. The exhibition’s “no rules” attitude meant freedom to wander from seat to seat, and if you wanted to experience the art, you had no option but to find your road legs. At one point I found myself on the floor and crammed between seats, watching a bus play by Larson and Abigail Entsminger. 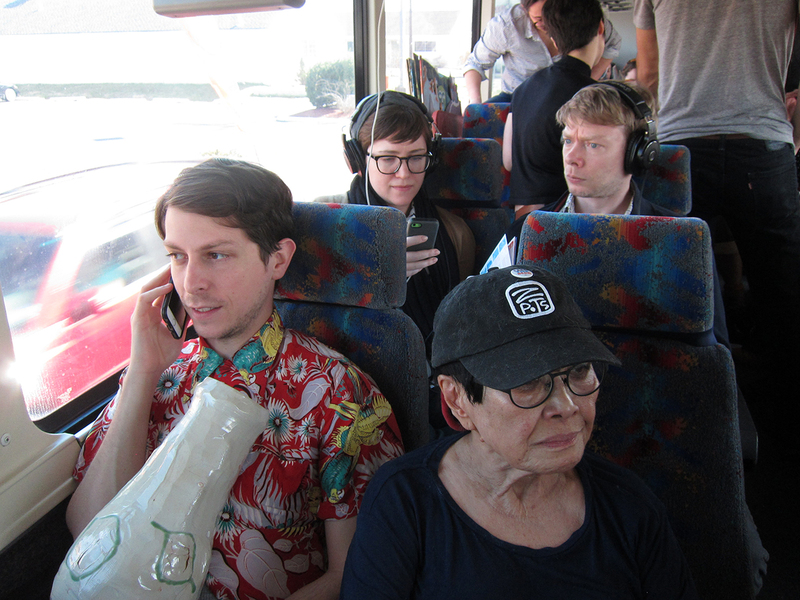 Four acts long and featuring a stage balanced on arm rests, props, audience interaction, and a monitor to display text, the production was a theatrical, over-the-top take on the only communal entertainment typically provided on buses: the films that screen on small monitors, which are themselves absurd, rarely well-functioning and essentially artifacts in the smartphone era. 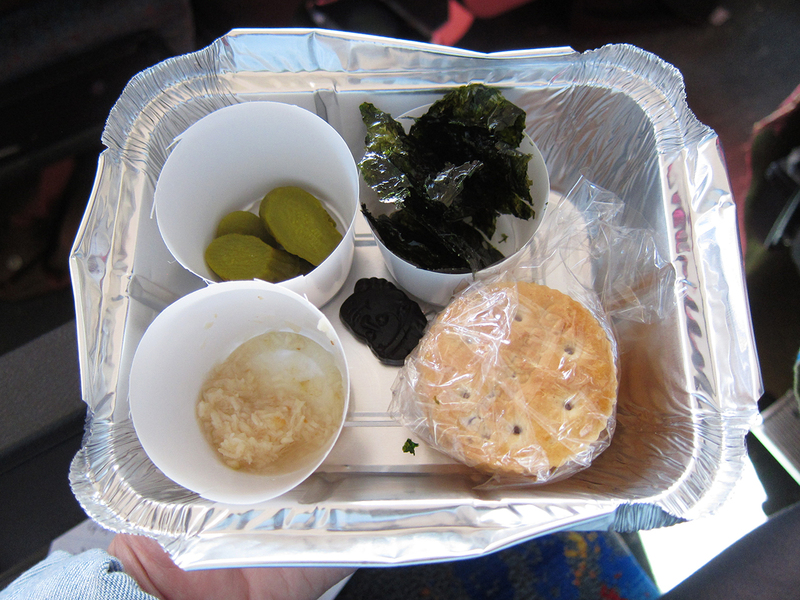 Later on, I sat atop a head rest eating seaweed and crackers provided as part of Marjan Verstappen and Jessica Vallentin‘s luxury snack and beverage service. It featured a site-specific menu: with the air of a flight attendant, Verstappen served the aforementioned foods as we drove by Newark International Airport to reference former regional wetlands replaced by urban infrastructure. 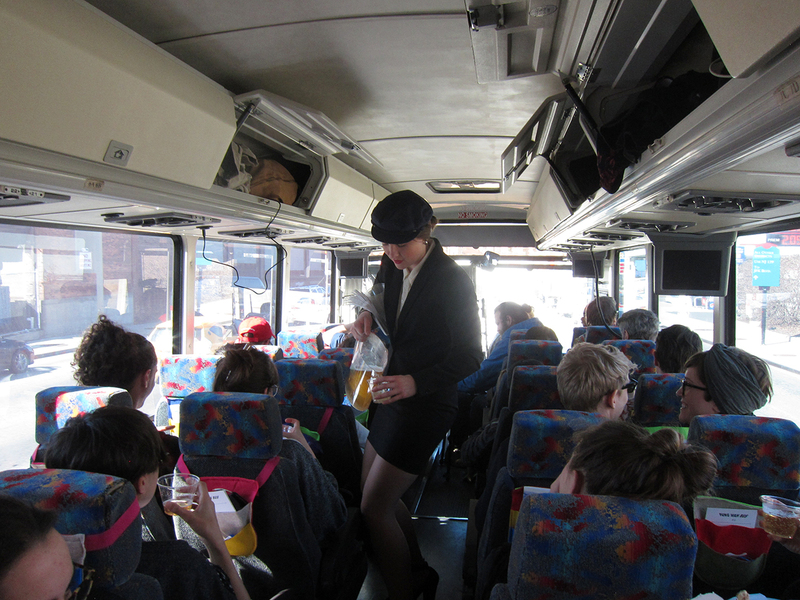 The service was a smart way to consider the landscapes that fly by our bus windows, while also highlighting the varying comforts of different transportation modes. Meanwhile, two subtler, solo performances were unfolding near the front. 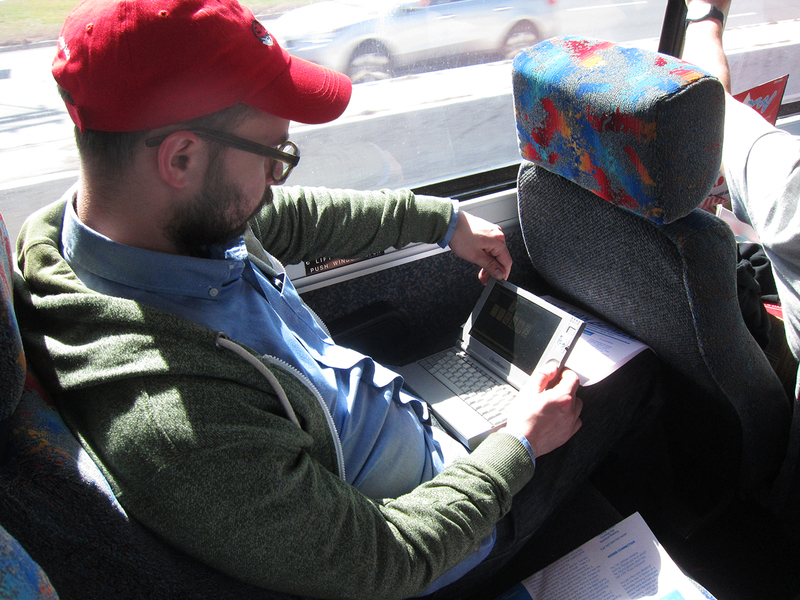 Joshua Caleb Weibley played solitaire on a Windows 98 laptop for the entire trip, in order to highlight the legacy of the electronic card game as a form of isolated entertainment. Not only does solitaire continue to be developed for almost all contemporary devices (unlike, for instance, 3D Pinball), but, as Weibley noted, the dragging motion it requires is echoed today in touch-screen technology, making it an early development in the history of the drag-and-drop. 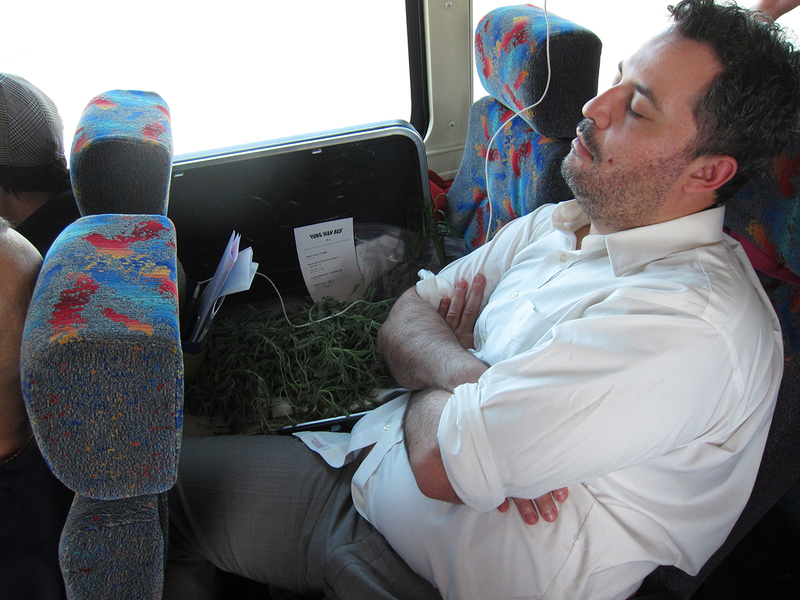 Across the aisle, Adam Milner took on the role of the dreaded bus companion, sustaining for the entire ride a bizarre cell-phone conversation about a hoarder while cradling a large ceramic pot, which he dropped upon our arrival in Philadelphia. I later learned that the shattering was deliberate and that Milner had been describing personal memories of his late grandfather — both suggesting how meaning changes when we don’t have enough context. In the space of a bus, where human encounters are physically close but, in the scheme of life, incredibly short, what kinds of relationships do we form with those around us, and how do we form them? 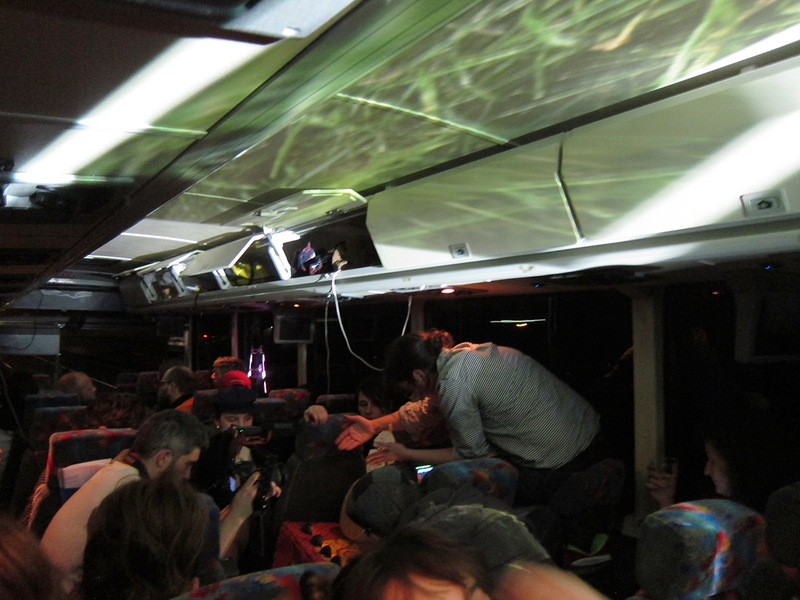 The biennial bus was ripe for social interaction: as at the opening of a regular exhibition, people met and mingled (and, at night, drank wine). But there were a number of projects on board that relied on such engagement, emphasizing bus travel as an inherently connected experience. 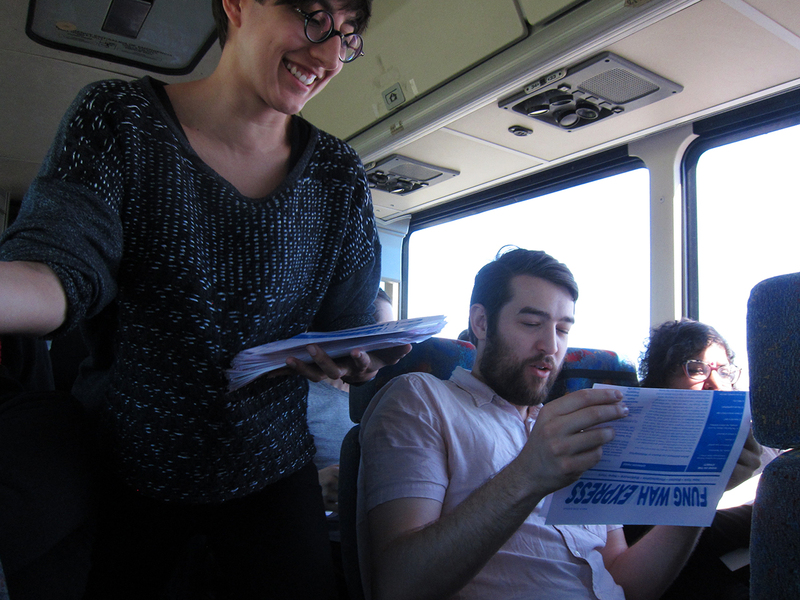 Occupying the back seat was the office for Jonah Levy‘s ongoing “Everyhere Northeast Travel Agency” project, in which Levy surveyed passengers for travel tips to add to a growing database and invited them to share their personal trip stories. 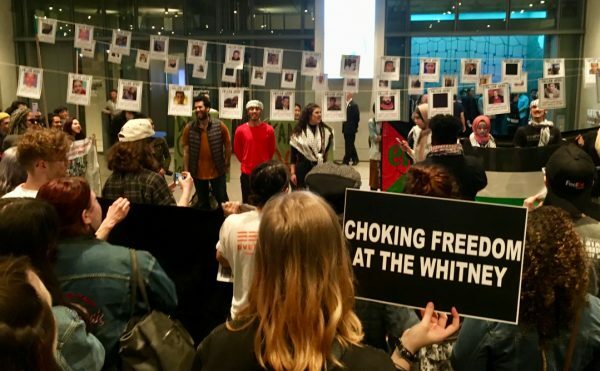 This was a space for intimate conversation, whereas the one created by Ariel Abrahams and Rony Efrat was very public: a WhatsApp group chat that anyone could join. The endless stream of notifications I received — and my constant urge to check them — nodded to how we much we remain glued to our personal devices during public commutes. For those preferring to tune out, Michael Barraco created playlists of pop songs inspired by birds, bringing to mind another kind of migration, one that’s necessary for survival. Barraco’s approach is light-hearted, but drawing attention to bird migration only becomes more important when one remembers the impact of climate change on flight patterns and avian populations. I was reminded of his playlists when I spoke with Chloë Bass (also a Hyperallergic contributor), whose biennial contribution reflected on the luxuries and privilege of human travel, from the purpose of a trip to the labor involved. 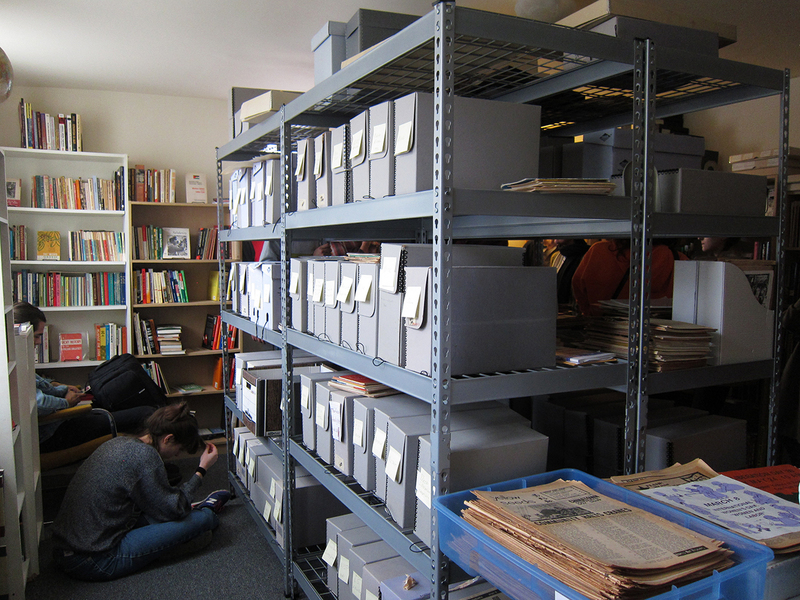 Bass’s “When we get there, we will know more than we know now” began upon arrival in Philadelphia and took the form of a field trip to the home of a leftist book specialist. On the way there, she mentioned her likely need to move out of her New York City apartment and how, if that time arrives, Philadelphia may be her only option for a new home that suits her lifestyle. In contrast, she contemplated what it means to throw around the idea of leaving the country if Donald Trump is elected president. 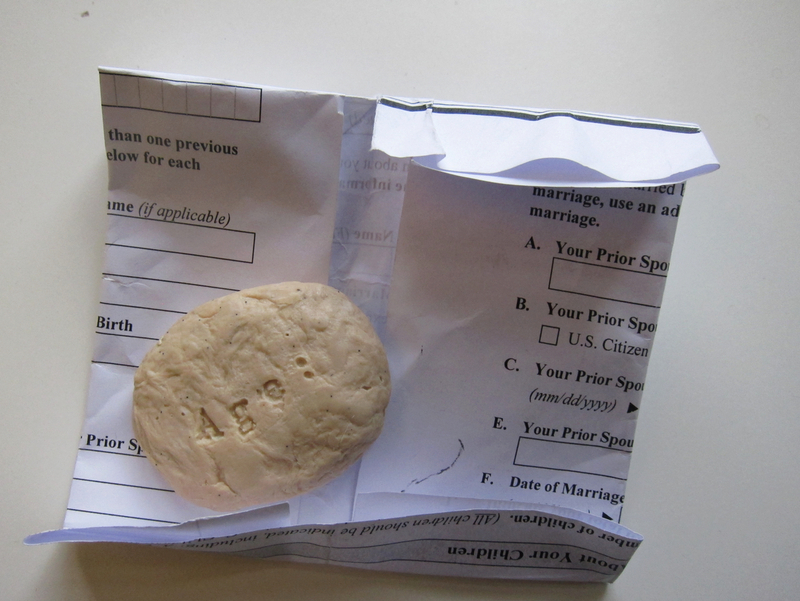 People who make those statements might be mostly joking, but the media discusses the matter seriously — and rarely do we consider that such a declaration suggests a privilege to easily and freely uproot one’s life by choice. Reflecting on these flexibilities and limitations is particularly apt as the number of asylum-seekers around the world only rises. Bass’s journey within a journey highlighted some of the complications of travel that, although they often come unexpectedly, are all part of the experience. We had to change our lunch plans because traffic had introduced slight delays in scheduling. Purchasing tokens for the subway from cash-only ticket machines frustrated many in our group, and moving a large crowd on public transportation was difficult. 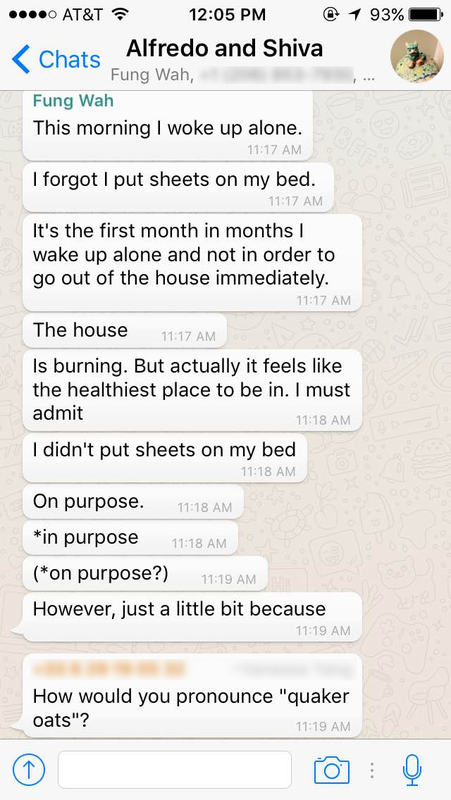 One member of our cohort realized she had left her phone on the bus; another, his wallet. 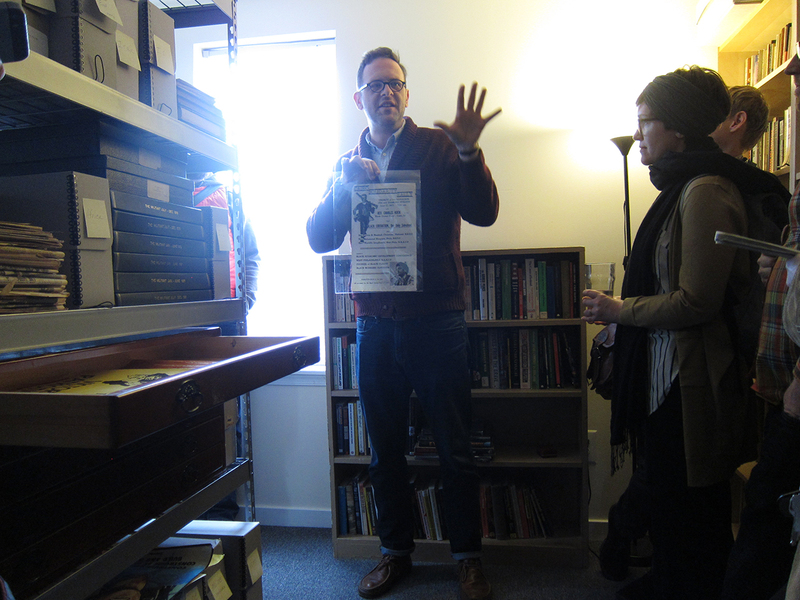 The main part of Bass’s contribution involved a tour of the R.F. 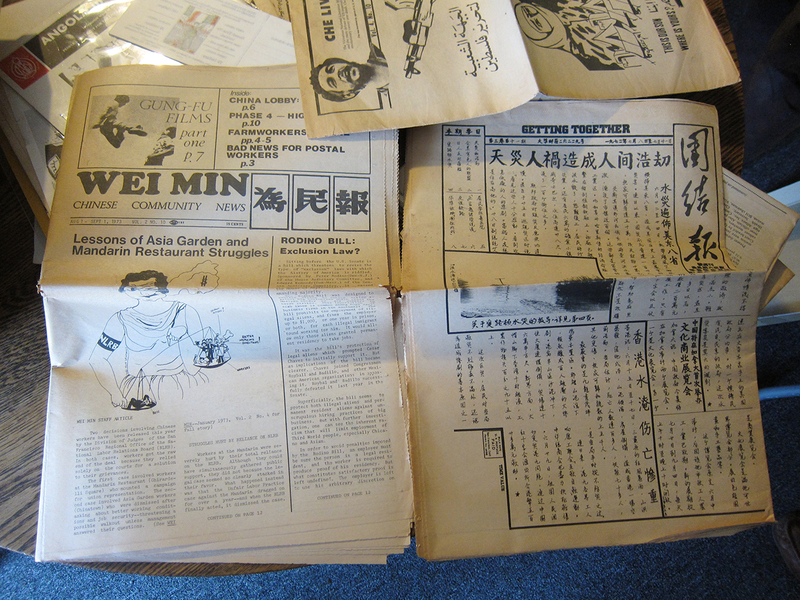 Kampfer Revolutionary Literature Archive, a collection of printed materials from radical leftist social movements of the 1960s and ’70s. 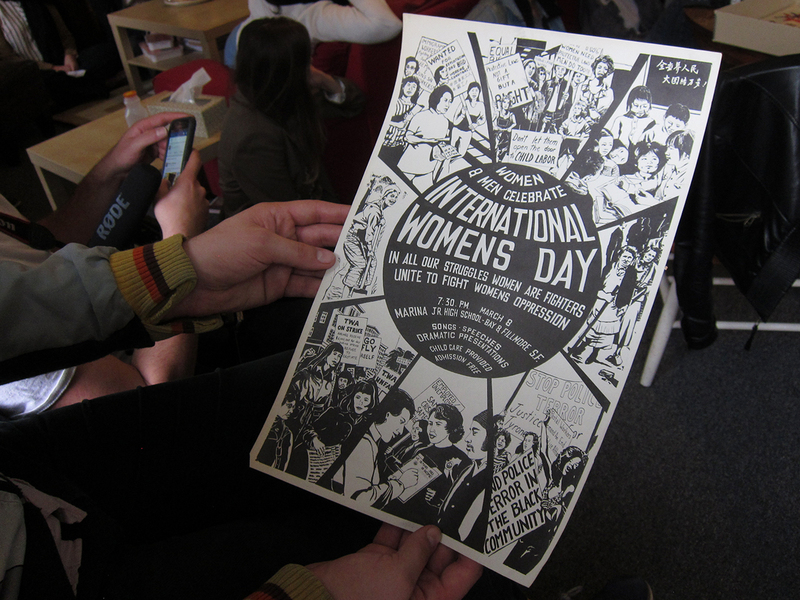 Housed in the home of University of Pennsylvania librarian Brad Duncan, many of the newspapers, posters, pamphlets, and more that Duncan showed us emerged from minority communities that were organizing against local worker exploitation but also tied to larger revolutionary causes overseas. 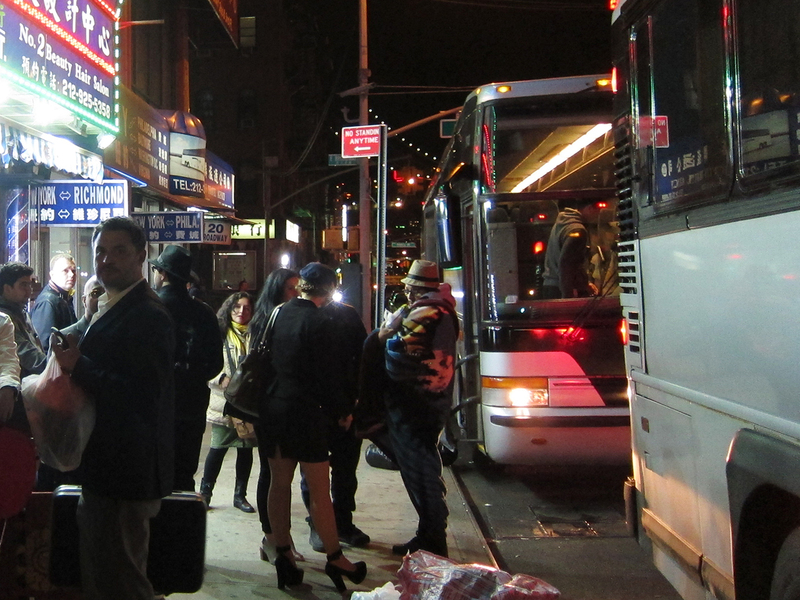 Some of these groups were based in NYC’s Chinatown; the visit was Bass’s way of addressing the working-class migrant community at the heart of our whole trip. Many Chinatown bus lines, including Fung Wah, were founded by Chinese immigrants, and most that remain are still run by Chinese Americans. In their early years, they functioned to transport immigrant restaurant workers or families visiting their children at school in different cities. But increased competition and price wars led to terrible working conditions, including draining schedules and low wages. 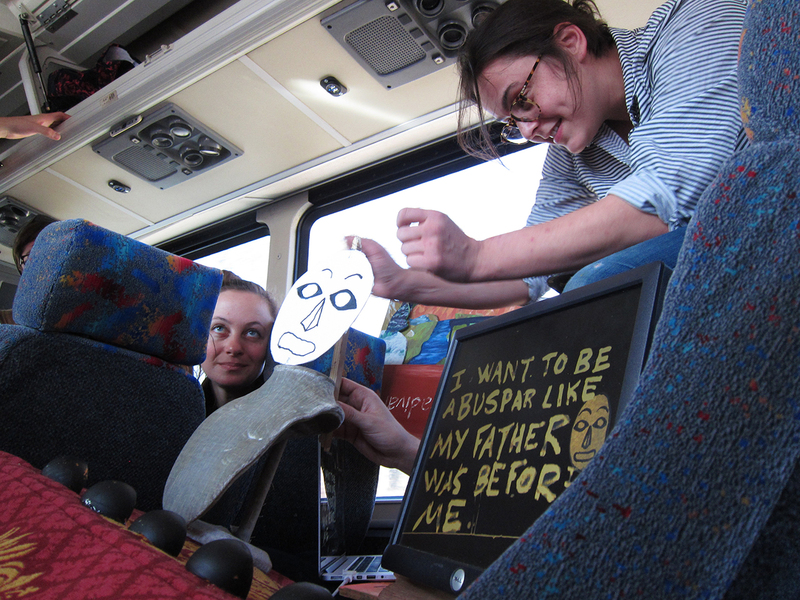 Most works that engaged critically with the history and labor practices of buses were not actually site-specific to the bus. Published online, Ruth Patir’s interviews with bus drivers give the often unsung transit heroes a voice as she probes them about their dreams. 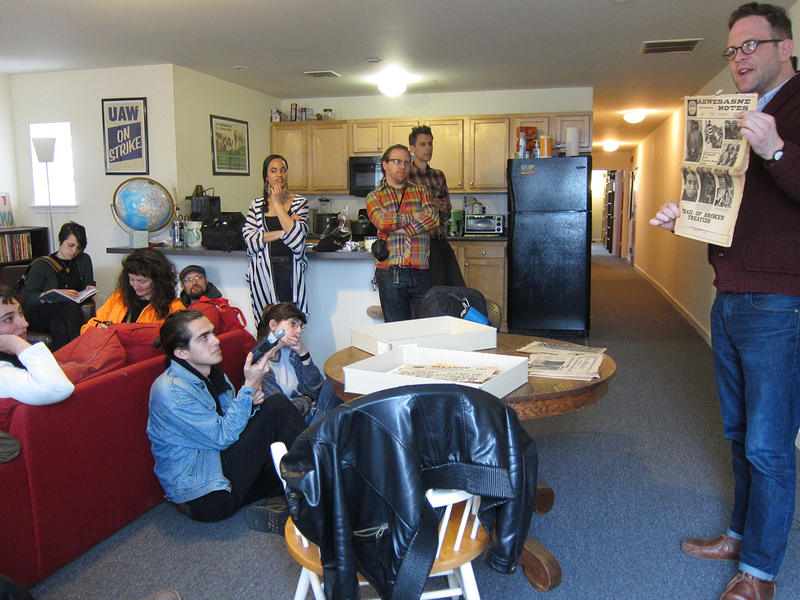 At the artist-run nonprofit Vox Populi, Meg Wiessner gave a lecture on the loud fabric patterns of intercity buses, tracing the chain of labor involved in making the material and examining the origin of the designs. 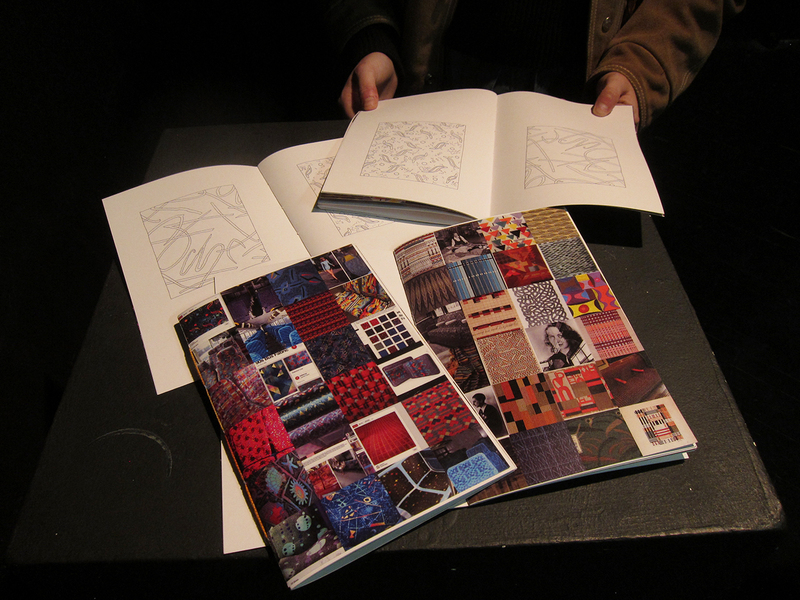 Her talk, also published in a zine, brought to light a type of public space design that we may easily take for granted but that has fascinating roots in the Bauhaus movement and even in traditional Middle Eastern carpet-weaving techniques. Now, as pricier buses such as Bolt and Greyhound adopt monochrome leather seats, not only are the interior appearances of transit lines changing, but so are the economies related to their manufacture, Wiessner noted. “There’s a changing geography of where things are produced,” she said. 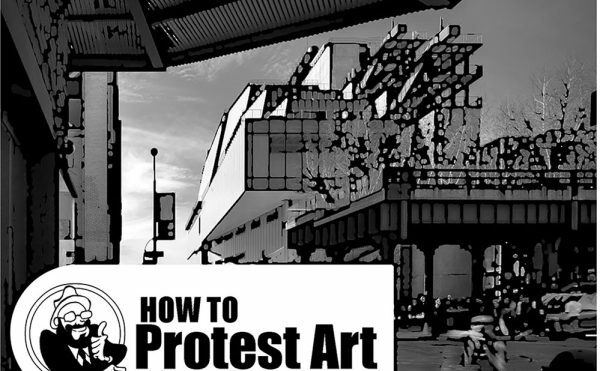 As we explored Philadelphia, another hot-button migration topic came to the fore: the threat of art spaces being priced out of their long-term homes to other neighborhoods or even cities. 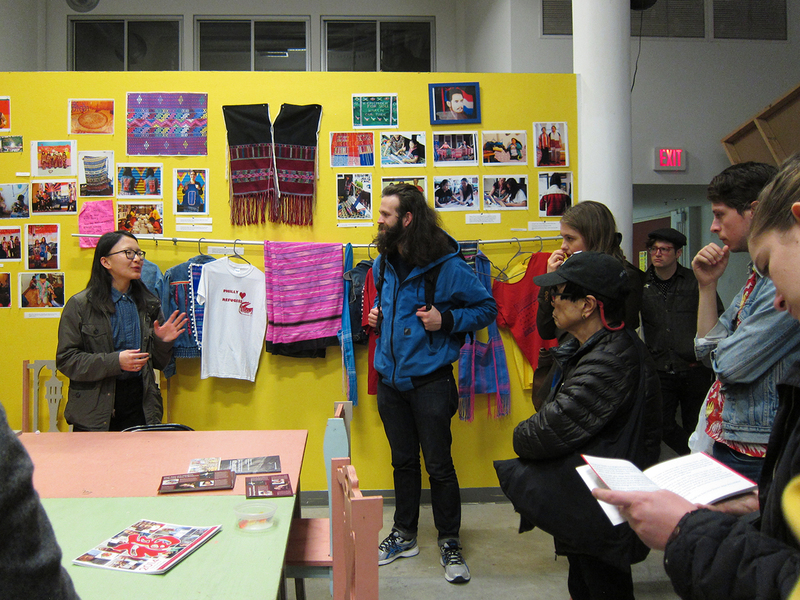 Visits to the artist-run Space 1026 and the Asian Arts Initiative stressed the community value of these spaces, not just as cultural centers but also as places where people can think critically about neighborhoods in transformation and the creative changes that might invigorate or improve them. 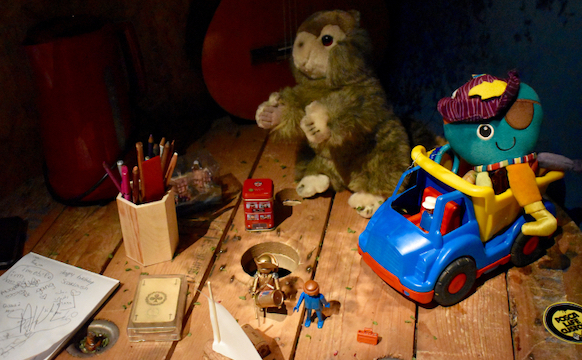 The Fung Wah Biennial bus itself represents a solution of sorts to artist displacement, functioning as a successful alternative and low-cost, albeit temporary, art space. Presented with a peculiar and tight area, the artists adapted to it in clever and unexpected ways, using a diverse array of mediums to circumvent physical limitations. 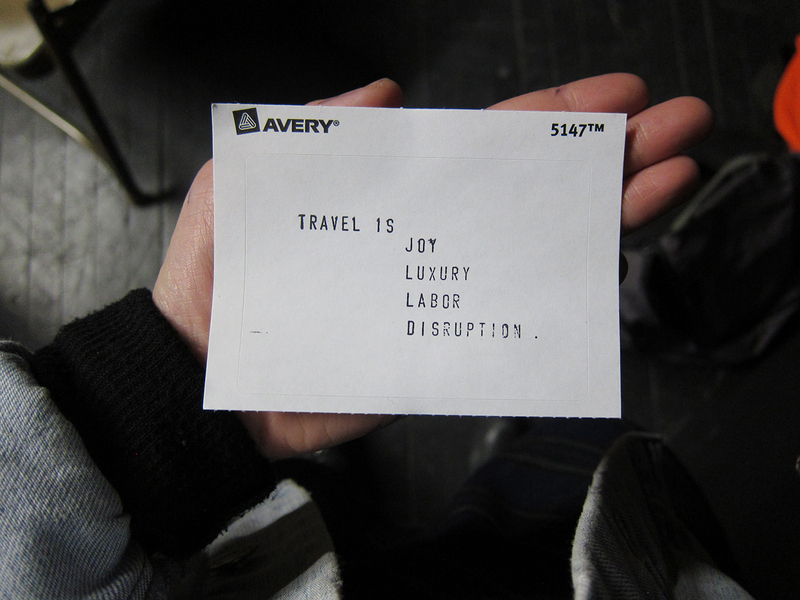 They thoroughly examined the nuances of travel, from the comforting to the thought-provoking, a range best summed up in a phrase Bass had printed on stickers and distributed: “TRAVEL IS: JOY / LUXURY / LABOR / DISRUPTION.” You could apply the same terms to the process of making art. The Fung Wah Biennial continues next weekend, with the bus traveling to Baltimore. The biennial will culminate in a physical exhibition gathering work from all three trips, opening at Flux Factory (39-31 29th Street, Long Island City, Queens) on March 25.